↑ 2,02,1 Roland Bauchot, ed. (1994). 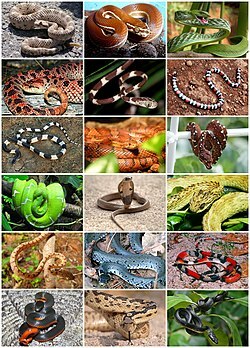 Snakes: A Natural History. Nova York: Sterling Publishing Co., Inc. p. 220. ISBN 1-4027-3181-7. ↑ 7,07,1 Sanchez, Alejandro. "Diapsids III: Snakes". Father Sanchez's Web Site of West Indian Natural History. Consultado o 2007-11-26. ↑ 8,08,1 Conant R, Collins JT. 1991. A Field Guide to Reptiles and Amphibians: Eastern and Central North America. Houghton Mifflin, Boston. 450 pp. 48 plates. ISBN 0-395-37022-1.